I stumbled across The Wooden Owl's shop over on etsy and as soon as I saw this I had to share it. 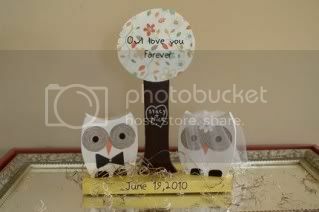 What's cuter (at least to me) then a little bride and groom owl sitting under a tree?? The "Owl love you forever might be a bit cheesy - but I do like the heart and names carved into the trunk. Even as an owl lover, I'm not so sure I'd want this as a centerpiece - but I'm sure I could find a place for it. The shop has other cool things as well... not all owls but all amazing.